I have something similar, I stacked heavy paving stones along the back to support the back side then graded the earth forward. As long as the blocks stones are large/heavy enough they should not move! Thanks Marq1. This is a good starting point... I have a few weeks to mull this over as we are still under a 3-foot balnket of snow up here in Quebec. Question: Did you bring the earth right up to the shed, or did you leave the paving stones visible at the shed entrance? I would attach some galvanized steel flashing to the shed first to protect the wood. 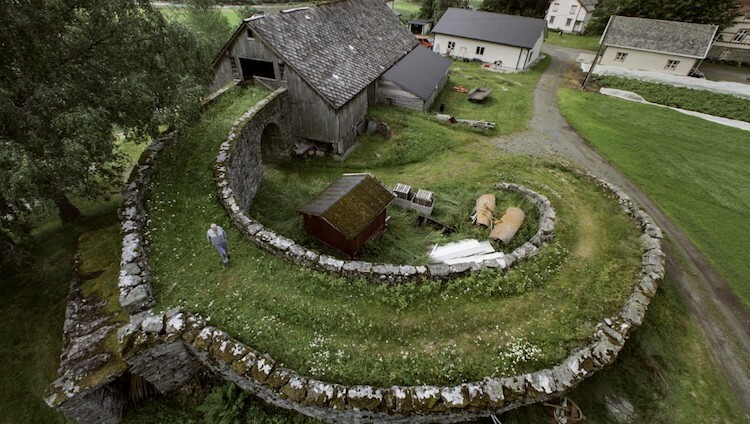 I am thinking of making an earth ramp like old barns sometimes have. Did you bring the earth right up to the shed, or did you leave the paving stones visible at the shed entrance? The earth bank barn, aka "Schweitzer" is the product of alpine hills with good drainage. When you build them on flat land, you need to include a "relieving arch" to separate the bank from the barn, otherwise the weight and moisture from the heap of dirt will eventually cause water and pressure problems. But, for a somewhat smaller project, you want a spacer of one or two courses of concrete block laid horizontally between the earth and your shed. This allows the earth berm to breath, prevents rot, and relieves the pressure. The blocks are up to the level of the shed floor but are between the structure and the earth so dirt never touches! Can you rotate the shed CCW 90 degrees so the side with the doors is at.near grade level? This would eliminate need for ramp. Thanks Marq1, that makes a lot of sense. I really, really have to mention the best (worst ?) 'redneck engineering" solution I've seen to this problem for a log splitting shed. Skip the ramp, pivot the shed. The rear corners and center were supported by a cribbing of split firewood. A quick kick knocks the front supports out. Pivot the entire shed down so that the front door jamb is on the ground. Drive the mower (log splitter) in. Kick the front supports back in. Last edited by Hal_S; 03-20-19 at 09:27 AM. Regardless of of how you transition it, I would hold the dirt down an inch or more to minimize splash. Obviously need to keep the mower deck in mind, so the steeper the ramp the less drop you'll want. Rather than a straight drop on the sides I feathered the ramp at the back door of my shop out so that I can mow up and back down across the ramp and right alongside of the door. The idea is good Beelzebob, but I have trees on both sides that I would have to cut down. So, not a workable solution in my case. Thanks all the same for putting it out there. Thanks Has_S. Some red neck solutions are really quite ingenious. I had a good chuckle over this one. Thanks aka pedro. Indeed, splash is a concern because of wooden doors. I do intend to feather the sides of the ramp as I envision having grass or some kind of low and/or creeping greenery.